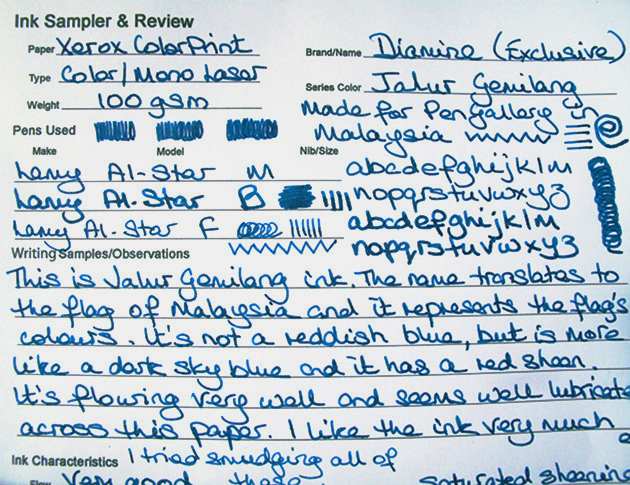 Today I'm reviewing Diamine Jalur Gemilang ink. This is a saturated dark sky/turquoise colour blue with red sheen. It’s not as heavily sheening as the Organics Studio high sheen inks, but has more sheen than what you would call a “standard” ink. 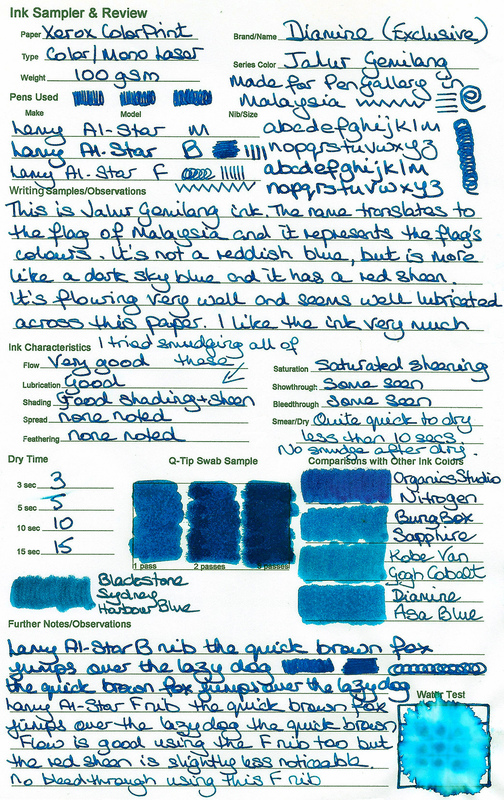 In my opinion, Diamine Asa Blue is a good comparison standard ink for Jalur Gemilang. So is Sailor LE Van Gogh Blue. It’s a great colour, whether you can always see the sheen or not. It easily washes off of my hands with cold water and a bit of bar soap (definitely not like Organics Studio Nitrogen, Ralph Emerson, or Henry Thoreau) and it easily flushes out of my converters and pens just using water. It dried quite quickly and once dry it didn’t smudge or smear. I tested for this by rubbing repeatedly across my writing within a couple of minutes of writing it. I saw no blue or red on my fingers, and no smudging on the page. I loved everything about it. However, I also love Asa Blue so this is my type of colour. I saw a bit of showthrough and bleedthrough even on my 100gsm smooth coated paper, but I could still have written on the reverse. Sheen is usually more visible when using pens with good flow and broader nibs. It’s good to have an ink that has a good sheen without going too far with it. That’s Jalur Gemilang. Nib Creep / “Crud”: Not seen. Staining (pen): Not seen after several days in the pen - easy clean-up with water. Staining (hands): Easy clean-up with bar soap. Clogging: Not seen. Seems unlikely. Water resistance: Not sold as waterproof and has no water resistance. Availability: Exclusively available from Pen Gallery Malaysia. So far these are scans and don't show up the red sheen as well as photos might. I have now added a couple of photos. I found the exact blue of this ink very difficult to get right on my screen. It's a deep turquoise shade/deep sky blue shade. Like Asa Blue but darker and more saturated. I tried my best to adjust the main review for hours, and I eventually adjusted the other papers. Thank you Chrissy. Very appealing dark blue teal on the Xerox paper. Not so much on the other paper samples though. Would that be because of the difficulty you were having getting the blue to render correctly? I can definitely hear its siren song. You're welcome. I've adjusted the colour on the other papers now. I'm still having a problem getting the colour correct and will have another look at it tomorrow in daylight. Oooh! More better! Your effort is greatly appreciated by many. I know how difficult it is to get colours to render correctly. Differing natural daylight colour temperatures don't help much either. Only difinitive way is to make a colour correction cave. Spectrally neutral Munsell 18% grey walls, soft indirect 65k lighting, blackout blinds and a 65k bias light behind the calibrated monitor. That way one has the same controlled environment regardless of time of day or season. Easy Peasy! Edited by Karmachanic, 16 July 2018 - 21:34. 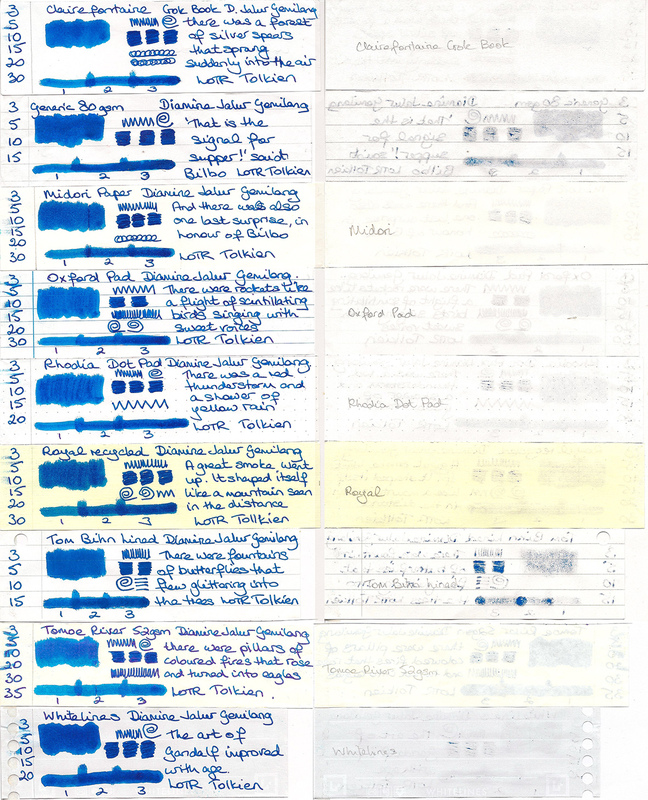 Well as I look at these papers now the ink looks more blue. It's so much more saturated on the paper than it looks on my monitor too. Very interesting, so the sample on the my previous post was affected heavily by the lighting? I see very small amount/none of purple in this one leaning towards sky blue color instead of the blurple. Oh and as an additional information, the straight translation of "Jalur Gemilang" is " Bright Path" if your basing it from the Indonesian word. I think that it should mean something similar in Malaysian. Edited by penzel_washinkton, 16 July 2018 - 22:51. I think that the "purple" colour you mention is the red sheen mixed with the blue. Chrissy mentioned that this sheen was missing in the scan. Well now! This looks very interesting indeed Many thanks for the review. As you're in England would you mind telling me where you got hold of it? I'm struggling to see it for sale online in the UK. First sentence of the review. Pen Gallery Malasia. Apologies for the ambiguity - I meant to ask whether it was for sale from within the UK, to avoid shipping/import tax etc. Sorry! Edited by npweston, 17 July 2018 - 11:01. You're welcome. Diamine provided me with a sample to review. I see, big chance it is probably the red sheen. Yes, it actually is. There are actually some difference in getting the meaning of the word depending on the context. Just realized that they meant Jalur as the Stripes, it can also means "Path" here so that's why I thought it as bright path initially. I wish my Xerox paper was white. It comes out with a pinkish beige cast when I scan it. I now use Photoshop curves to make the paper white, but I used to use the magic wand I think. Might be the scanner. They too can be calibrated. I have tried out every possible setting on my scanner. Sadly nothing changed the colour of the paper. My monitors (iMac, MacBook Pro) seem to be OK I think, although I'm not sure how to calibrate those either. Basically I'm old and a dinosaur when it comes to this sort of stuff. Ooooh. Love it. I'm sold. 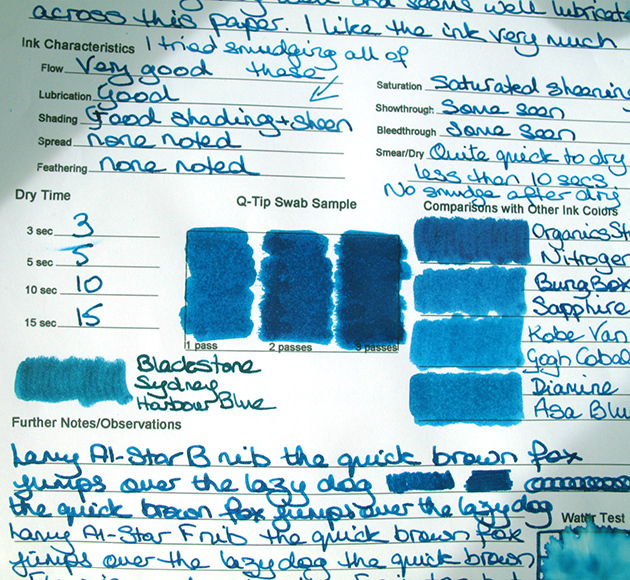 I'm normally not a fan of blue inks but this one looks like a very pretty colour. And as I spend a fair bit of time in Malaysia as well (nowhere near the Pen Gallery shop though), it would be meaningful on top of pretty. Thank you for this nice review - and for the information quite simply; I may have remained blissfully unaware of this ink's very existence. Shipping is cheap in Malaysia. You're welcome. I'm pleased to be an inky enabler. Great review, Chrissy. Nice-looking blue, but I must admit that I find the name more impressive than the ink. You're welcome Yes the name sort of makes you look twice doesn't it.